Question 5: I see. Yesterday, there were reports that al-Baghdadi was captured by the Russian and Syrian military at the border of Syria and Iraq. Can you confirm it? President Assad: No, no. That’s not true. President Assad: No, no. That’s not true. Anyway, those borders are under the control of ISIS till this moment., it’s neither Syrian nor Russian, not even Western or American or any other one; it’s only ISIS who’s controlling those borders, so it’s safe for al-Baghdadi to be in that area. Question 6: Let’s talk a little bit about this missile strike from the United States. So, the Shairat airbase quickly returned to its operation, but many wondered why the Syrian Army didn’t hit the US missiles, didn’t try to down it, why? 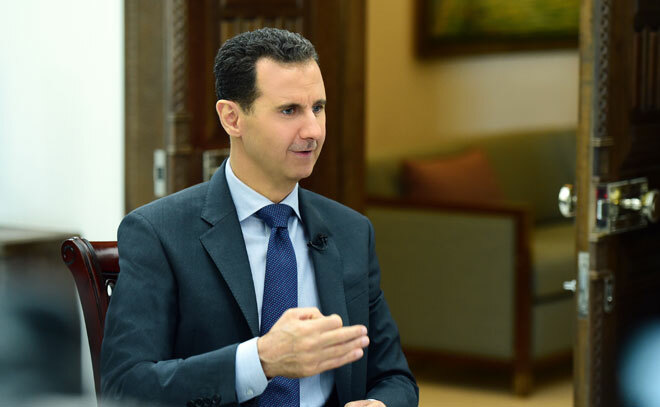 President Assad: Many people wonder about whether our air defense or the Russian air defense and they look at it as absolute power that can take down any missile. Technically, it’s complicated, because the missile must see its target, let’s say, our missile, and to see it you need a radar that can see every angle of the country which is impossible because you’re talking about terrain and topography, and as you know the cruise missiles use those terrain in order to hide from the radar, so it needs an intensive system to see every angle, in that way you can take it down. This is one. 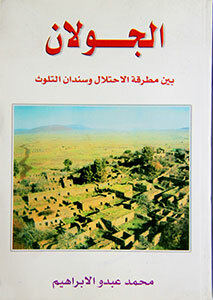 Second, maybe a few people knew that the terrorists at the very beginning of the attacks, they started by destroying the Syrian air defense, which has nothing to do with what they called it that time the “peaceful demonstrations.” Most of the air defense are outside the cities in outlying areas, so they started attacking that air defense and it was affected dramatically during the crisis. So, you have many factors that could influence taking down those missiles. Question 7: So, how many items from the air defense system you lost during these attacks by terrorists before the US launched its attack? President Assad: A huge number, a huge number. It was the first target. The first target was the air defense. We don’t have to give a precise number now, because as you know it’s military information, but I can tell you more than fifty percent. Of course, the Russians, through their support to the Syrian Army, they compensated part of that loss with quality armaments and air defense systems, but this is not enough when you talk about a full country. It takes a long time to recover all your air defense. Question 8: Are there any concrete negotiations underway with the Russians regarding the purchasing of new air defense systems? President Assad: Yes, it’s always the case, before the war and during the war. Of course, we need more armaments after the war and because of the consumption, and this is part of the daily relation between the two institutions in the Ministry of Defense in Russia and Syria. Question 9: What kind of systems are you interested in now after the attack, like S-300, S-400, or what kind of system? 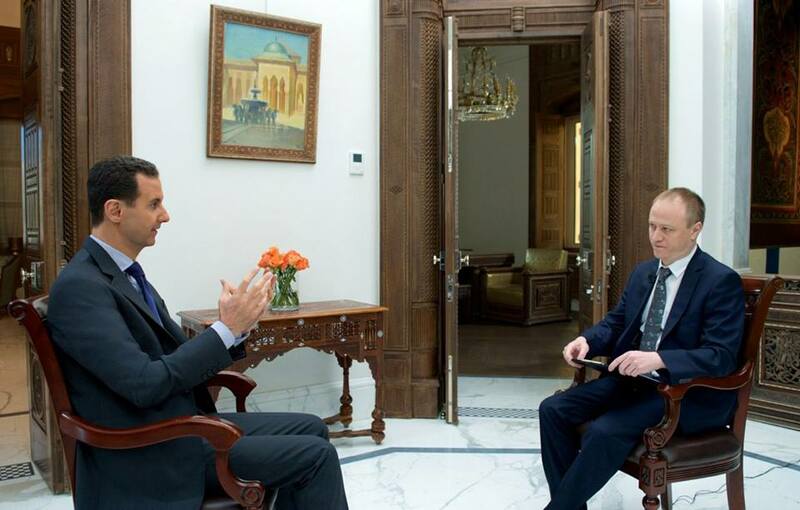 President Assad: Usually we’re always interested in the last generation of any system, but that depends on what’s available, that depends on the policy of the vendor, which is Russia, and that depends on the prices. You have many criteria and that depends of course on the specifications that you’re looking for that could be suitable to your kind of war, to your army, to your terrain, to many other criteria that’s related to the air defense. Question 10: Has there been any talks of possible non-repayable deliveries, delivery for free from Russia, or is it a commercial contract? President Assad: In this situation, I mean our war, Russia looks at this war as more than Syrian war, and more than Syrian-Russian war. I think it’s the war of every country that wants to protect its citizens from the terrorists. So, when Russia supports our army, it not only protects the Syrian citizens, it also protects the Russian citizens, and I think the European and others. So, for them they don’t look at it as commercial war like the Americans; when they launch a war they calculated how much jobs can you create out of this war. They look at it as a war that needs to protect their citizens, our citizens, other citizens, the position of Russia, the balance, the political balance, the military balance around the world, as a great country. So, in that regard, you don’t look at the armaments as how much do they cost or how much do they bring as benefit or profit. Question 11: Alright. So, Damascus has said that it is ready for the mission of the Organization for the Prohibition of Chemical Weapons to come and to investigate the Khan Sheikhoun incident. Have there been any contacts between you and this organization, and what are the possible dates for the arrival of the first team of experts? 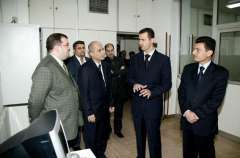 President Assad: Actually, since the first attack a few years ago that happened in Aleppo by the terrorists against our army, we asked the United Nations to send investigation delegation in order to prove what we said about the terrorists having gases used against our army, and later many incidents happened in that way, and they didn’t send any delegation. It’s the same now. We formally sent a letter to the United Nations, we asked them in that letter to send a delegation in order to investigate what happened in Khan Sheikhoun. Of course till this moment they didn’t send, because the West and the United States blocked any delegation from coming, because if they come, they will find that all their narratives about what happened in Khan Sheikhoun and then the attack on Shairat airport was a false flag, was a lie. That’s why they didn’t send. Now the only contact I think is between Russia and maybe the other countries in order to send that delegation. Till this moment, we didn’t have any positive news regarding any delegation coming. Question 12: What is your view of what happened there? Because there were a lot of different reports of different kinds, and misinterpretation and accusation of fake news. So, what happened there according to your information? 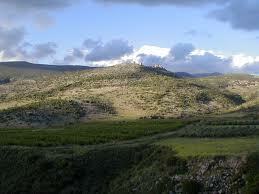 President Assad: Actually, that area is under the control of al-Nusra Front which is Al Qaeda. The only information the whole world has is what this organization or this group – which is al-Nusra – published on YouTube, on the internet in general, and in different outlets, mainly Western outlets, so we cannot base our judgment on their reports. First of all, we don’t know if the site that we attacked that day half an hour before noon, about 11:30, was a chemical warehouse or depot or anything like this. And their story said that the attack happened at 6, 6:30 in the morning. We didn’t launch any attack at that time. So, you have two possibilities: the first one is that there was an attack at lunch time or at about 11:30. The other possibility that we believe in is that it was a false flag, there was no attack, all what we saw as pictures and videos was like the videos we’ve been seeing for the last year or two years or more regarding the White Helmets, the humanitarian Al Qaeda which is an elusive story, let’s say, it doesn’t exist anyway, and the picture that shows children being killed by Russian airstrike to discover later that it wasn’t a real picture, they put a boy, they covered him with mud and blood, fake blood of course, and so on. All these ploys could be part of them. That’s what we believe in, because the attack was already prepared, and they didn’t want to listen, they didn’t want to investigate; they only wanted to launch the attack. We believe it was a false flag for one reason and a simple reason: if there was gas leakage or attack, and you’re talking about 60 dead in that city, how could the city continue its life normally? They didn’t evacuate the city. No-one left the city, life continued as normal, and this is mass destruction. The other day, they attacked Shairat where they said there was the gas depots, and they attacked all the depots, and there was no gas coming out of that airport. No-one of our army officers or military staff, was affected by any gas. So, for us, there was no gas attack and no gas depot, it was a false flag play just to justify the attack on the Shairat base. That’s what happened. Question 13: So, the main version is that no chemical weapons or no chemicals were used there? 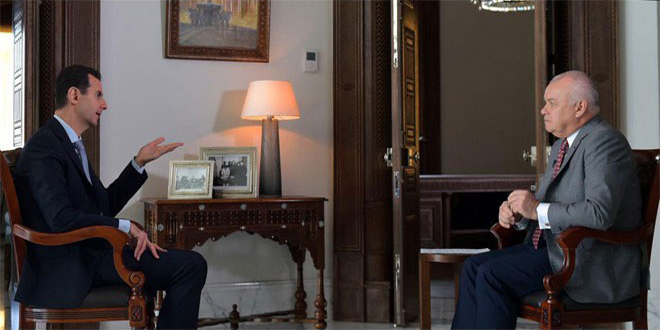 President Assad: No, I mean even if you look at the pictures, you can see that the rescuers – presumable rescuers – were rescuing people without masks, without gloves, and they were moving freely. How? This is against all the specifications of the sarin gas that they talked about. They cannot, they would have been dead like the others, and you don’t know that those people who are lying on the ground were dead or not. You can fake this image, it’s very easy. So, you cannot just base your judgment on images and videos, especially made by Al Qaeda. Question 14: And what about possible future provocations like that, because our President Putin has said that there’s information that such kind of provocations could happen in the future. What is your assessment of this possibility? President Assad: Actually, this possibility is not only because of what happened recently. It happened before, and we had this possibility a few years ago, since the first time they used it in 2013, since that time it’s a possibility for us, and it’s been used, it wasn’t only a possibility, but this time the propaganda was different, because everybody was ready for the attack, so that was part of the agenda, part of the plan, it was one plan, it wasn’t two different incidents. So, of course it is a possibility. This is first, I mean because it happened before. Second, because the regime in the United States hasn’t changed. Since the collapse of the Soviet Union, the United States has been attacking different countries in different ways without taking into consideration the Security Council or the United Nations. So, the deep regime hasn’t changed, the deep regime is the same that go and attack and kill and tell lies in order to justify what you are doing or what you have been doing. So, nothing has changed regarding the United States. They can do it any time, they can do something different, because their aim is to destabilize Syria, their aim is to change the government, to topple the government, and to bring their puppets instead, so they will do everything, for them the end justifies the means, no values, no morals at all, anything could happen. Question 15: And is there a threat of using of chemical weapons by the terrorists? And if so, from where do they get it? From which countries? President Assad: From Turkey. Directly from Turkey, and there was evidences regarding this, some of them have been shown on the internet a few years ago. You had many parties and parliament members in Turkey who questioned the government regarding those allegations. So, it’s not something hidden. Many in Syria knew that, and the only way, the only route for the terrorists to get money, armaments, every logistic support, recruits, and this kind of material, is through Turkey, they don’t have any other way to come from the north. So, it’s a hundred percent Turkey. Question 16: Let’s go to another point about the military situation. When will the Syrian Army start an operation to liberate Raqqa, and will the Kurdish units be involved, and will Russians be involved, and is there a possibility of cooperation with the Western coalition and Iraqi forces? President Assad: Regarding fighting terrorism, we always announce that we are ready to cooperate with any country who is genuinely ready or wants or has the will to fight terrorism. We didn’t even define which countries; any country including the West, taking into consideration that we already know that the West supports the terrorists and it doesn’t have a will to fight them. But we said whoever is ready, we are ready. Regarding the Syrian-Russian cooperation and talking about the Kurds, we always talk with different factions in Syria who are fighting the terrorists, of course with the Russians regarding this. The and we had direct contact with the Kurds, and question on how, you know that only a month ago our army was advancing from Aleppo towards the east, toward Raqqa, it wasn’t far from reaching Raqqa, and this is when the terrorists launched their attack against the middle of Syria, against the city of Hama, in order to protect ISIS in two areas: the eastern area is Hama, which is close to Palmyra after we liberated Palmyra recently, in order to slow the advance of the Syrian Army in that direction. The second one is toward Raqqa for the same objective. 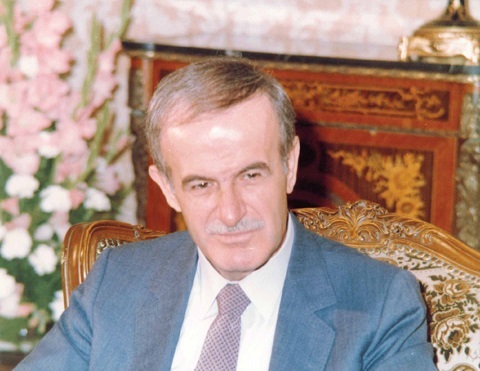 And actually because of that attack on Hama we had to slow down our attack – not stop it, to slow down – because part of the troops, Syrian Arab Army troops, in both directions have to come south and west to Hama in order to defend the city, and of course they repelled the attack and they succeeded, but at the expense of advancing in different areas. So, that will tell you about the relation between ISIS and al-Nusra, and the relation between ISIS and al-Nusra and Turkey, and of course Turkey means the United States, and the United States means France and the UK, and both mean Saudi Arabia, and so on. So, this is one choir actually, and they have one army, one proxy army, which is different factions, mainly Al Qaeda, mainly al-Nusra and ISIS. So, that’s why our advancement toward Raqqa has been slowed down, because we changed the priority because of different fronts of the terrorists. Question 17: I see. And regarding Turkey, you’ve mentioned, so in the north of Aleppo, in al-Bab, the Syrian Army is facing Turkey forces that have invaded Syria in breach of international law. Will the Syrian Army undertake any action to put an end to this Turkish intervention, and so when and how this could take place? President Assad: When you talk about the Turkish invasion, when you talk about the American troops – again, it’s an invasion – and when you talk about the terrorists on the ground, it’s one entity, there’s no difference. There’s one master who’s controlling all these factions. So, the priority now is to defeat the terrorists. When you defeat the terrorists, the Turkish army and any other army will be weak on the ground. Their real strength are their proxies, not their own army. 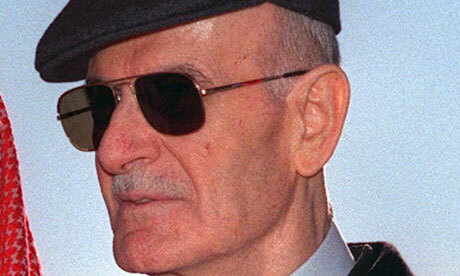 In that regard, when you defeat the terrorists in different areas, it’s going to be very easy to expel any other one including the Turks; either they leave, or it’s your land, you have to defend it, you have to go and fight, you can’t say “they can stay” or “let’s negotiate.” No, you don’t negotiate; it’s your land, you defend it, you expel them, you fight them. But the priority now is to fight their proxies, because they are the strongest element on the ground. Question 18: And do you expect military escalation after the US missile strike, and can this result lead to direct confrontation between Syria and the United States? 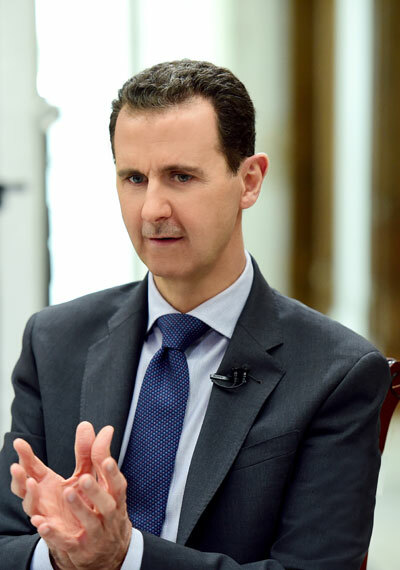 President Assad: Actually, as you know, they attacked the airbase from the Mediterranean, so you’re talking about hundreds of miles, sometimes thousands of miles away, which is out of our reach as Syrian Army. So, if we want to be realistic, we can say we don’t reach their ships in the Mediterranean, but if you talk about the troops on the ground, again, the same like the Turkish issue, when you defeat their terrorists – because the terrorists are their terrorists – this is where you can go and fight others who occupy the land. In that regard, the Americans, like the Turks, like any other occupiers, they have to get out by their will or by force. Question 19: Do you think that there can be an improvement in the bilateral relations between Syria and the United States? President Assad: We always try to look at the full half of the cup, but we couldn’t find it. We tried to see anything positive, we said that what this president, Trump, what he said, we said “promising,” I described it as promising, a few months ago. But actually, it’s not about what they promise, because we all know that the American officials say something and do something different, they’re never committed to their promises or their words. So, that’s what have been proven recently after the attack on Shairat; they say something and they do something different. So, in politics you don’t say “I wouldn’t do this.” Whenever there is a window of hope that this state or this regime can change its attitude toward respecting your sovereignty, toward more preventing of any blood-letting in your country, you have to cooperate. It’s not a personal relation, it’s not hate and love; it’s the interest of your own people. So, I cannot say this escalation has changed anything, because this escalation is the real expression of the reality of the American regime that’s been there for decades, it’s not new for the United States to do such a thing, but you need to deal with the United States as a great country, at least to make it refrain from any harmful effects, generally, I’m not talking only about Syria. When they change their behavior, we are ready, we don’t have a problem. Question 20: Have you tried to establish any contacts, or do you plan to have contacts with representatives of the Trump administration? President Assad: Not really, we don’t have any channel now between Syria and the United States regime or administration, we don’t have. Question 21: Okay, and how do you assess the emerging coalition between the United States and Kurdish units? Have you taken steps to prevent the establishment of self-ruling region in the north of the country? President Assad: We don’t have control in that area, in the meantime, but talking about self-control or confederation or anything like this, when you don’t have war, when you have a normal situation, it’s going to be related to the constitution, because Syria is a melting pot of different cultures, different ethnicities, religions, sects, and so on. So, not a single part of this social fabric can define the future of Syria; it needs consensus. So, regarding what you mentioned, it’s better to wait to discuss the next constitution between the different Syrian shades of our spectrum, let’s say, and this is where we can tell how’s it going to be there. Our impression today is that the majority, the vast majority of Syrians, never believe in self-governance or confederation or anything. In this time, it’s being used as an excuse because there’s no government in that area. They say “we are governing ourselves because there is no government.” It’s an excuse for today, but when you have stability and the government taking control of the country, of course there’s no excuse to deal with such a situation unless there’s a constitution that allows a certain area to have its confederation or federation or any other way of governance. Question 22: And regarding the constitution, have you already started the project that is now debated in Geneva, and what do you think about the proposal of withdrawing the word “Arab” from the name of the country? 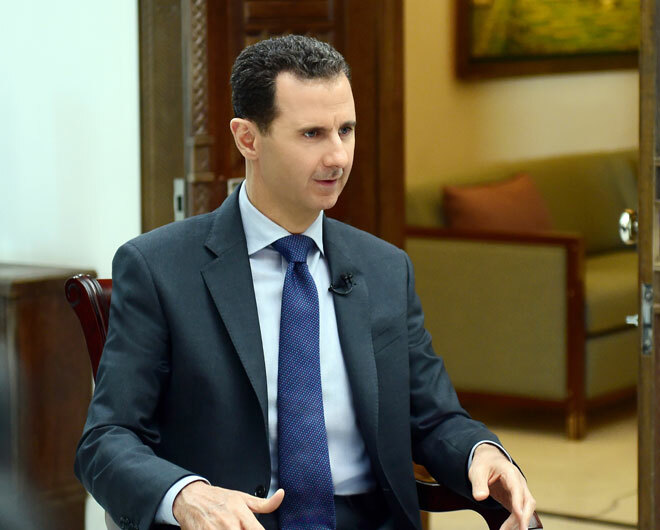 President Assad: Again, as a government, we don’t own the constitution; it should a Syrian consensus. If the Syrians don’t believe in the word of “Arab state,” what’s the meaning of having this word? Just because the government believes? No, we have to be the mirror of the majority of the Syrians, when we say yes or no. Our impression is that the majority of the Syrians, they adhere to this word, because this is their identity, the majority of Syrians are Arabs, and they believe in their identity. But again, I wouldn’t say that this is right or wrong till the Syrians have their own say in a referendum, before saying the President said he supports this word or he’s against that word. It means nothing in the meantime. It’s still early to discuss that point, it’s not a contention issue, I mean, nobody is discussing it now. A few people in Syria, mainly among the Kurds, mention this issue. It’s not a big problem. Question 23: And what is the most contentious issue, according to you? President Assad: To the constitution? Journalist: To the constitution, yes. 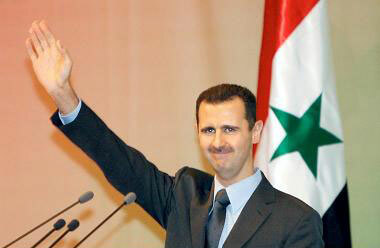 President Assad: Being secular. Most of the factions that apparently joined the negotiations in Astana and part of them in Geneva, they don’t accept a secular state, they want it a religious state, Islamic state. This is the most important part of, could be, the disagreement regarding the constitution. Of course till this moment we haven’t started direct negotiations, but we know through the mediators what they propose, and what we propose. Question 24: So, we just talked about the situation in the north, and something is happening there down in the south. So, do you have any information about Jordan’s plans to deploy its troops in Syria in coordination with the United States under the pretext of fighting ISIS? Certain media reported. And if this is the case, do you think that there is a threat from the neighboring countries to dismember Syria? President Assad: We have those information, not only through the media, through the different sources, because you know we have the same tribes, the same families living on both sides of the borders, so they can see any changes in the mood or in the logistics, any new plans of the army you can see it on the ground. So, we have such information, but anyway Jordan was part of the American plan since the beginning of the war in Syria. Whether he likes it or not, he has to obey the orders of the Americans. Jordan is not an independent country anyway, whatever the American wants, it will happen, so if the Americans want to use the northern part of Jordan against Syria, they’re going to use it, so it’s not about Jordan, we don’t discuss Jordan as a state; we discuss Jordan as land in that case, because it’s the United States who defines the plans, who defines the players, and who endorses everything regarding Syria coming from Jordan, and many of the terrorists coming from Jordan, and of course Turkey, since day one of the war in Syria. Question 25: Let’s talk a little bit about the situation in Mosul. What is your estimate of the number of ISIS militants pushed out of the Mosul region into the Syrian territory? And to what extent did the coalition’s operation in Mosul and the withdrawal of terrorists strengthen the positions of ISIS here in Syria? Could this, for instance, lead to the full terrorist control over Deir Ezzor? President Assad: If we want to link different events with each other, we can have the answer. First of all, no-one has a precise number of ISIS coming to Syria because it’s a free border now; you don’t have regular borders, you don’t have Syrian Army, you don’t have police, you have no state there. So, no-one can tell you, but the estimation from the information that we have from the citizens in those areas, they talk about tens of thousands of fighters of ISIS coming to Syria. If you go back a few months ago when the alliance airplanes attacked our military site beside Deir Ezzor, they attacked one of the major sites, it’s a mountain called Thurda, which is a strategic mountain to protect Deir Ezzor from being in the hands of ISIS. They attacked our army for more than one hour, and they killed tens of our soldiers, and they said “sorry, it was a mistake,” although it is a big mountain, a huge mountain; you cannot make a mistake, it’s not a building. Then later, they started allowing the fighters coming from Mosul. Of course, they wanted to do a two-aspect operation. The first aspect is that the United States is attacking ISIS in Mosul, they are against ISIS, but at the same time, they are supporting ISIS and they allow them to cross the border from Iraq into Syria. It means they helped ISIS to come to Deir Ezzor and to undermine the Syrian Army who are defending Deir Ezzor. They wanted Deir Ezoor to fall into the hands of ISIS and maybe later in one of their plays like what happened in Jarablus, in Ein al-Arab, in different areas, they will make negotiations with ISIS to leave Deir Ezzor and to say that they liberated Deir Ezzor to send their proxies and puppets to attack them. Fortunately, the Syrian Army was resilient and strong enough to repel ISIS after the alliance attack a few months ago. Now, it’s advancing slowly, recapturing the area from ISIS slowly, but the situation today is better than yesterday and better than a week ago, and so on. So, your question is a hundred percent correct. That’s an American plan, and they allow them and they give them the cover to come to Syria. Question 26: So, it changes the situation, the military situation as you said, the threats from the north, from the Iraqi part of the borders, from Jordan, and the military missile attack from US ships. In this situation, are you going to ask Russia for more help to enhance the Russian assistance, including probably on the ground? President Assad: Actually, the Russian air forces were very effective and efficient during the last year and a half, little bit more, in supporting the Syrian Army, and everybody knows that since that support started in 2015, the balance has changed, and we could recapture Palmyra and Aleppo and many other areas, and we could defend Hama recently; it was a very huge and well-organized attack, but we could repel it. So, that support was very efficient, and of course, we shouldn’t forget the efficient support of the Iranians on the ground; they did not send troops, but with their officers, with their advisors, they played a very important role. So, I don’t think now there is a need for ground troops. Sometimes when there is intense attack on different fronts, as you mentioned, north, east, south, and in the middle, the Russian missiles attack from the sea. The Russian strategic bomber came from Russia to attack in Syria. So, the military support, the Russian military support is not limited to their base in Syria. Actually, they are aware about what the need of the fight; you have this fluctuation, but you don’t need troops on the ground till that moment. Maybe in the future if our enemies and their supporters, their terrorists, the proxies, change their strategy and bring more terrorists from around the world, and you have full armies of terrorists at that time, it could be needed, but at this moment, I don’t think it’s needed. What’s been done is good and enough. Question 27: Regarding the future of the political settlement, how do you see it, taking into account the low effectiveness of the Geneva talks? And can Astana replace Geneva as a main platform for negotiations? And another question: are there any people with whom you are ready to contact, to engage in direct talks from the opposition side, I mean from those who come to Astana, from the military factions, or in Geneva? President Assad: First of all, our estimation of Geneva is that it hasn’t started yet; till this moment, nothing, it’s a still-born, it’s dead, because, I mean if you want to buy utility in the market, the first you read on the box is the requirement, what’s the requirement for this utility to work properly, to deliver what you expect? The same for anything in this world. If you are talking about Geneva, it could be a good idea. Astana is a very good idea, but do we have the requirement for these two means to produce? Till the moment, no, because part of this event which is Russia, Iran, and of course Syria, they are willing to achieve a peaceful solution. They respect the sovereignty of Syria, they’re looking for the unity of Syria, they respect the Charter of the United Nations, the different Security Council resolutions, and so on, while if you look at the other party, the Western bloc with their allies in the region and their proxies, of course, they are in the other side. They are using these events only as a political umbrella for the terrorists, not for the political solution. So, the requirement is that to have one objective. Now, you don’t have one objective; you have different objectives, you have at least two objectives. You need to discuss it with the other side, let’s call them opposition, whether they are militants or political opposition, but they are different factions and they have different points of views. So, you are not talking about one entity. So, many of the requirements haven’t been provided yet in order for these initiatives to succeed till this moment. Now, are we ready to sit? Of course, in Syria we sat with the terrorists, and how can we make those reconciliations if we don’t sit with them? From the very beginning, we noted that there was no real and genuine political track for the reason that I just mentioned. 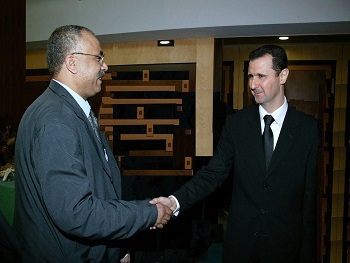 So, I said let’s go and pave the way for your own political track, which is direct negotiations with the terrorists or militants in different areas, and tell them if you give up your armaments, I will give you amnesty and you go back to your normal life, live normally like any other citizen. Otherwise, if you are not part of this reconciliation, you can leave anywhere you want, and that’s what’s happening today and yesterday and every day, that’s happening from time to time, and that helped the stability in many areas in Syria, and that undermined the terrorists and their masters. So, yes, we are ready to sit with whoever could help us in stopping this blood-shedding in Syria, whoever, we don’t have any problem, we don’t have any taboo in that regard. Question 28: But you don’t have any preferences as well? President Assad: In what way, what do you mean? Journalist: In the way of having some concrete people, concrete names, with whom the Syrian government can talk directly? President Assad: No, sometimes, you can say I’m going to sit with political opposition, I wouldn’t sit with the militants, let’s say. I would sit with the opposition that’s not linked to Qatar or to Saudi Arabia or to France, and so on. It’s not part of the foreigner or foreign agenda against Syria, but at the end, the main question that you are going to ask before starting any negotiation: is he able to deliver? What can he do? If I sit with somebody who doesn’t have any influence on the ground, on the reality in Syria, what are we going to agree upon? It’s just a waste of time. So, actually we are very pragmatic in that regard; we say let’s sit with whoever can change the situation in two ways. The first one is to stop the killing, this is number one, this is a priority for every Syrian, not for the government; every Syrian. If you ask anyone, he’ll tell you we need security, we need stability, this is number one. Second, if you want to discuss it politically, you can talk about anything. You can talk about the constitution, the future of Syria, the political system that you want, the economic system; anything is going to be viable. It won’t be complicated that time, but without stability, you cannot achieve anything in any negotiation. That’s why I said, we went directly to talk to the militants, that is not our preference, as your question, but it’s the most effective in the meantime. Question 29: You’ve mentioned Qatar and Saudi Arabia, and recently Kazakhstan as a host country of Astana process invited… not invited, but proposed to invite more countries to this process, including Qatar and the Saudis, how do you think about that? President Assad: I think the more countries you have, the better, in different ways; you either have more support to this initiative and that will protect that initiative and raise the possibility of success, or you have the same countries that they are going to oppose it whether they are part of it or outside. But if they are part of it, you can point at them, you can tell them that you’re part of the problem and you have to help, and if you are genuine about helping, not only by your discourse and rhetoric, this is the initiative, be part of it and show us that you are against the terrorism, show us that you support what the Syrian people want. So, in both ways, it’s positive to invite whoever wants to come. So, I support what the Kazakhstani officials announced yesterday about expanding the participation in Astana. Question 30: Recently, the foreign ministers of Russia, Syria, and Iran assessed their talks in Moscow as a success. Would you like to build on this success and hold that trilateral meeting on a presidential level? President Assad: It’s not about the level, what they expressed in their statements, their views, it represents their presidents, because the minister of foreign affairs, he works with the president anyway. So, it’s not about which level, because whoever talks, any official, represents the whole government, the whole state. Maybe if there is a necessity in the future to do it, of course it’s a good idea, but for us in Syria, now the priority is to reach the objective. It’s not about the formalities, let’ say. Question 31: Let’s talk a little bit about the bilateral relations in the economic filed. So, recently, our Vice Prime Minster Dmitry Rogozin has visited Damascus and he said that there was an agreement to promote Russian companies in Syria, and that he received guarantees from you that Russian companies will be well-received and have priorities here. So, what are the specific mechanisms that were established to fulfill this purpose? President Assad: We have our laws regarding how to make contracts with the different companies. We already started with some of the companies after his visit, especially as the Western companies left Syria, not because of the security situation, not for security reasons, actually for political reasons. So, if we want to call it market, the Syrian market is free now for Russian companies to come and join and to play an important part in rebuilding Syria and investing in Syria. The most important part for me, and I think for them as well, is the oil field, the oil and gas, and some Russian companies now joined, let’s say, that sector recently during the last few months, and the process of signing the contracts, the final, let’s say, steps of signing the contracts is underway. So, that’s how I look at it. Journalist: Alright Mr. President. Thanks a lot for this interview. It was very frank and very interesting. Thank you very much.